RUSH: The NFL owners and players had a secret meeting last October in New York NFL headquarters. And the purpose of the meeting was to discuss what the hell to do about players kneeling and problems caused to the NFL because of the president tweeting about the disrespect shown to the flag by players kneeling during the national anthem. The owners and players got together in an “unprecedented” meeting at NFL headquarters. And Roger Goodell starts out by saying, “The first thing we gotta do is remember: This is confidential.” Well, somebody audiotaped the whole thing — the whole thing — and today the highlights of the meeting appear in the New York Times. And one of the highlights… Whoever taped this thing — somebody — made sure that the New England Patriots owner, Robert Kraft, was kind of thrown under the bus because of what happened in the meeting. RUSH: Here’s the NFL story. Look, it’s got a little bit more to it than I’m gonna devote to it now. We’ll save some of it for tomorrow. But the NFL and players had a meeting last October in the midst of all of the losing fans, losing TV ratings ’cause players are kneeling during the anthem, disrespecting the flag, the anthem, and all that. So Goodell calls a meeting at the NFL in New York on Park Avenue. And it’s a big room. And it’s the first meeting of its type where many players and all the owners got together. Around the table it was owner, player, owner, player. They were intermingled. It was not players on one side, owners on the other. Goodell, the commissioner, starts the meeting by saying, “Let’s make sure we keep this confidential.” Well, somebody in the room recorded the whole thing and then they sent the tape or the recording — probably digitized — to the New York Times. So the New York Times got audio of the entire meeting where every participant thought it was essentially off the record. No media was in there. “The New England Patriots owner Robert K. Kraft pointed to another ‘elephant in the room,'” that they hadn’t yet started talking about. “‘This kneeling,’ he said,” players kneeling during the anthem. 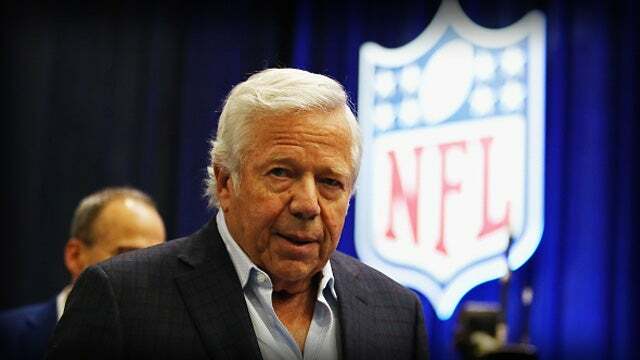 “‘The problem we have is, we have a president who will use that as fodder to do his mission that I don’t feel is in the best interests of America,’ said Kraft, who is a longtime supporter of Mr. Trump’s. ‘It’s divisive and it’s horrible,'” Mr. Kraft is quoted as saying about Trump. And that’s it. It goes on. “The owners were intent on finding a way to avoid Trump’s continued criticism.” Well, this New York Times notes that Mr. Kraft “is a longtime supporter of Mr. Trump’s;” yet look what he’s quoted as saying in a room where he thinks nobody’s listening. Don’t doubt me on this. Other people are quoted, but none of them appear to be contradictory or hypocritical. And it ends up, if you read the whole thing, the NFL still doesn’t get why what was happening was hurting them. They still don’t get it. Some of the owners do, but they don’t get it. As I say, I’ll set it aside and analyze it further tomorrow.